VMware today announced that its virtual networking software and security software products packaged together in an offering named NSX will be available in the fourth quarter of this year. The company has been running NSX in beta since the spring, but as part of a broader announcement of software-defined data center functions made today at VMworld, the company took the wrapping off of its long-awaited virtual networking software. VMware has based much of the NSX functionality on technology it acquired from Nicira last year. The generally available version of NSX includes two major new features compared to the beta: technical integration with a variety of partnering companies, including the ability for the virtual networking software to control network and compute infrastructure hardware providers. Secondly, it virtualizes some network functions like firewalling, allowing for better control of virtual networks. The idea of virtual networking is similar to that of virtual computing: abstracting the core features of networking from the underlying hardware. Doing so lets organizations more granularly control their networks, including spinning up and down networks, as well as better segmentation of network traffic. Nicira has been a pioneer in the network virtualization industry and last year VMware spent $1.2 billion to acquire the company. In March, VMware announced plans to integrate VMware technology into its product suite through the NSX software, but today the company announced that NSX’s general availability will be in the coming months. NSX will be a software update that is both hypervisor and hardware agnostic, says Martin Casado, chief architect, networking at VMware. The need for the NSX software is being driven by the migration from a client-server world to a cloud world, he says. In this new architecture, there is just as much traffic, if not more, within the data center (east-west traffic) as than the data traffic between clients and the edge devices (north-south traffic). One of the biggest advancements in the NSX software that is newly announced is virtual firewalling. Instead of using hardware or virtual firewalls that would sit at the edge of the network to control traffic, instead NSX’s firewall is embedded within the software, so it is ubiquitous throughout the deployment. This removes any bottlenecking issues that would be created by using a centralized firewall system, Casado says. VMware has signed on a bevy of partners that are compatible with the NSX platform. The software is hardware and hypervisor agnostic, meaning that the software controller can manage network functionality that is executed by networking hardware from vendors like Juniper, Arista, HP, Dell and Brocade. In press materials sent out by the company Cisco is not named as a partner, but VMware says NSX will work with networking equipment from the leading network vendor. On the security side, services from Symantec, McAfree and Trend Micro will work within the system, while underlying compute hardware from OpenStack, CloudStack, Red Hat and Piston Cloud Computing Co. will work with NSX. Nicira has worked heavily in the OpenStack community. VMware has been rather cagey about its plans to launch its own hybrid cloud service, announced at a recent Strategic Forum for Institutional Investors. Companies are usually more than happy to talk journalists’ ears off about a new product or service, but when InfoWorld reached out to VMware about this one, a spokesman said the company had nothing further to share beyond what it presented in a sparse press release and a two-hour, multi-topic webcast. In a nutshell, here’s what VMWare has revealed: It will offer a VMware vCloud Hybrid Service later this year, designed to let customers seamlessly extend their private VMware clouds to public clouds run by the company’s 220 certified vCloud Services Providers. Although the public component would run on partners’ hardware, VMware employees would manage the hybrid component and the underlying software. For example, suppose Company X is running a critical cloud application on its own private, VMware-virtualized cloud. The company unexpectedly sees a massive uptick in demand for the service. Rather than having to hustle to install new hardware, Company X could leverage VMware’s hybrid service to consume public-cloud resources on the fly. In the process, Company X would not have to make any changes to the application, the networking architecture, or any of the underlying policies, as VMWare CEO Pat Gelsinger described the service. “[T]he power of what we’ll uniquely be delivering, is this ability to not change the app, not change the networking, not change the policies, not change the security, and be able to run it private or public. That you could burst through the cloud, that you could develop in the cloud, deploy internally, that you could DR in the cloud, and do so without changing the apps, with that complete flexibility of a hybrid service” he said. One of the delicate points in this plan is the question of how it will impact the aforementioned 220 VSPP partners, which include such well-known companies as CDW, Dell, and AT&T as well as lesser-known providers likeLokahi and VADS. Would VMware inserting itself into the mix result in the company stepping on its partners’ toes and eating up some of their cloud-hosting revenue? 451 Research Group analyst Carl Brooks took an optimistic view on the matter. “Using VSPP partner’s data centers and white-labeling existing infrastructure would both soothe hurt feelings and give VMware an ability to source and deploy new cloud locations extremely quickly, with minimal investment,” he said. Gartner Research VP Chris Wolf, however, had words of caution for VMware as well as partner providers. “VMware needs to be transparent with provider partners about where it will leave them room to innovate. Of course, partners must remember that VMware reserves the right to change its mind as the market evolves, thus potentially taking on value adds that it originally left to its partners. SP partners are in a tough spot. VMware has brought many of them business, and they have to consider themselves at a crossroads,” he wrote. Indeed, VMware’s foray into the hybrid cloud world isn’t sitting well with all of its partners. Tom Nats, managing partner at VMware service provider Bit Refinery, told CRN that the vCloud Hybrid Service is not a welcome development. “Many partners have built up [their infrastructure] and stayed true to VMware, and now all of a sudden we are competing with them,” he said. As to customers: Will they feel comfortable with entrusting their cloud efforts in part to VMware and in part to one or more VMWare partners? Building and managing a cloud is complex enough without adding new parties into the mix. One reason Amazon Web Services has proven such a successful public cloud offering is that they fall under the purview of one entity. When a problem arises, there’s just one entity to call and one throat to choke. Under VMWare’s hybrid cloud model, customers may need to scrutinize SLAs carefully to determine which party would be responsible for which instances of downtime. Meanwhile, VMWare would have to be vigilant in ensuring that its partners were all running their respective clouds properly. VMware customers will no longer be penalized for using more virtual memory. Just over a year ago, VMware shocked many of its longtime customers with a new pricing model that charged customers based on the amount of virtual infrastructure they used instead of the amount of physical infrastructure. By charging customers based on use of virtual memory, or VRAM, VMware seemingly penalized customers who succeeded in deploying many virtual machines on few physical servers. After a customer outcry, VMware raised the VRAM “entitlements” to make the change less punitive. Today, VMware did away with the VRAM pricing model altogether. At VMworld in San Francisco, newly minted VMware CEO Pat Gelsinger referred to VRAM as a four-letter, dirty word. “Today I am happy to say we are striking this word from the vocabulary,” he said, drawing an extended ovation from the crowd. VMworld is being attended by 20,000 people, and a huge portion of them attended this morning’s keynote. From now on, pricing will be all per-CPU, and per-socket, Gelsinger said. By moving back to a pricing model based on usage of physical infrastructure, VMware is once again encouraging users to get as many virtual servers as they can out of each physical machine, which is the point of virtualization in the first place. Gelsinger never mentioned specific pricing, but a press release provided a few details about the new pricing of vSphere, VMware’s flagship virtualization software. This new, hardware-based pricing applies both to the forthcoming version 5.1 of vSphere and the existing version 5.0. More details can be found in this VMware pricing document. There is also vCloud, a broader software suite including vSphere and numerous other data center automation tools. Prices for vCloud 5.1 will start at $4,995 per processor. VMware said version 5.1 of vSphere will become generally available on September 11. It has enhancements including the ability to perform live migrations of virtual machines without the need for shared storage. We’ll have more details from VMworld as the conference goes on. Malware may be the first to target virtual machines, long used to block attacks. Researchers have uncovered a single espionage malware attack that is capable of infecting multiple platforms, including computers running the Windows and Mac OS X operating systems, Windows-powered mobile devices, and VMware virtual machines. When Ars first chronicled the trojan backdoor known as Morcut last month, we reported that it turned Macs into remote spying devices that were capable of intercepting e-mail and instant-message communications and using internal microphones and cameras to spy on people in the vicinity of the machine. Since then, researchers have developed a more comprehensive view of the malware, which is known by the name “Crisis.” A JAR, or Java archive, file that masquerades as a legitimate Adobe Flash installer allows attacks to infect a much wider variety of platforms, including virtual machines, which many people use to protect themselves from infection when performing online banking or while researching malicious websites. 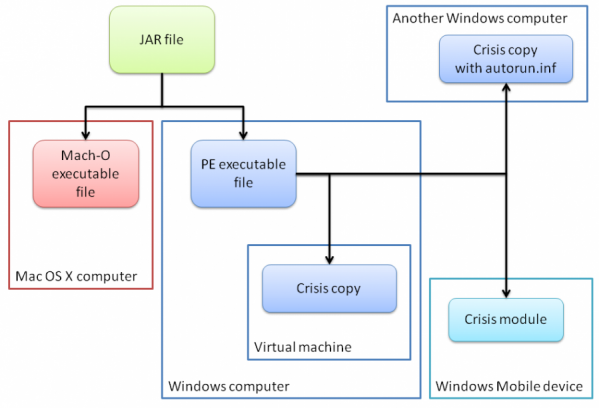 When encountering a Windows-based PC, Crisis actively searches for VMware virtual machine images. When they’re found, the malware copies itself onto an image using VMware Player, a tool that makes it easy to run multiple operating systems at the same time on the host machine. As illustrated in the image above, the JAR file first determines whether it’s present in a Mac or Windows environment. When loaded onto an OS X machine, Crisis accesses a Mach-O file that’s capable of running on Macs. When loaded into a Windows environment, the malware uses a standard Windows executable file to infect PCs, the VMware Player attack to infiltrate virtual machines, and a module that targets Windows Mobile devices when they’re connected to a compromised Windows computer. So far, Crisis has been detected on fewer than 50 machines worldwide, according to data from Symantec. But given its ability to infect Macs and Windows PCs with a backdoor that taps communications sent by Skype, Adium, MSN Messenger and other apps, Crisis was already considered to be important. It’s even more noteworthy now that its virtual-machine capabilities have been uncovered. VMware is developing an impressive new feature called WSX that will allow users to access virtualized desktops remotely through any modern Web browser. VMware developer Christian Hammond, who worked on the implementation, demonstrated a prototype this week in a blog post. According to Hammond, WSX is built with standards-based Web technologies, including the HTML5 Canvas element and Web Sockets. The user installs and runs a lightweight Web server that acts as a relay between the Web-based client and the virtualized desktop instance. It is compatible with VMware Workstation and ESXi/vSphere. WSX, which doesn’t require any browser plugins, is compatible out of the box with Firefox, Chrome, and Safari on the desktop. It will also work with mobile Safari on iPads that are running iOS 5 or later. Hammond says that Android compatibility is still a work in progress. The performance is said to be good enough to provide “near-native quality and framerates” when viewing a 720p YouTube video on the virtualized desktop through WSX in Chrome or Firefox. Users who want to test the feature today can see it in action by downloading the Linux version of the VMware Workstation Technology Preview. Although it’s still somewhat experimental, WSX is a compelling demonstration of how far the Web has evolved as a platform. It also shows how the ubiquity of Web standards make it possible to deliver complex applications across a wide range of platforms and device form factors. VMWare this week showed off a solution to separate the personal and professional lives of smartphone users – on the same phone. VMWare’s Mobile Virtualization Platform software essentially places two copies of the operating system on the phone. One, unlocked and modifiable, is for personal use. The other, provisioned by a company’s IT administrator, uses the apps and policies used by the company’s internal network. In the future, callers will be able to dial one number for business and another for personal use, and reach the same phone, executives said. The software was originally announced earlier this year at the Mobile World Conference in Barcelona. Phones based on the technology from LG and Samsung are expected “in the coming months,” VMware said. VMware executives showed off the technology running on a Galaxy S II smartphone. VMWare’s solution addresses the so-called “consumerization of IT,” where consumer devices owned by company employees are being asked to do dual duty as corporate devices. In some cases, that can mean data that should otherwise remain confidential can be exposed to an employee’s child, who picks up the phone. The solution? Two copies of the phone’s operating system running on the phone, with the more secure corporate environment running in a virtualized state. Doing so will require the phone to “check in” on a regular basis to report its secure status. But that can also be done according to an IT admin’s policies, so a phone could be left out of range while on an overseas vacation, Razavi said. A demonstration of the Horizon Mobile software was exceedingly simple: on the surface, the Galaxy S II appeared as a standard consumer phone, with the sort of apps and widgets you might use in your own personal life. Tapping a “work phone” icon brought up a screen where Razavi entered a PIN. From there, he was launched inside the work environment. At least in the demonstration, the shift was fast and seamless. When he was completed, another click on a “personal phone” icon brought Razavi back to the original personal phone screen. In the demo, the virtualized phone even ran a different version of the operating system: Android 2.2, versus the Android 2.3 version used on the “personal” version of the phone. Provisioning the device requires a manufacturer to add a portion of the software, and then the IT administrator to provision the phone over the air. That process should take between 10 to 15 minutes, Rasavi said. The data and operating systems are isolated from one another, so that recording a long birthday party video, for example, won’t erase sensitive data. But the software also includes a shared notification bar, so that alerts for emails for the work environment can notify the phone in personal mode, Rasavi said. If you plan on running multiple operating systems on your Mac, one route you can take besides a direct installation like Windows in Boot Camp is to use a virtual machine, which installs the OS within OS X so it and its applications will run alongside your OS X applications. There are several virtualization options for OS X, including VMware Fusion and Parallels Desktop, both of which offer robust solutions for running multiple operating systems that integrate the guest operating system well with the Mac OS. Recently, Parallels released an update to its latest version of Parallels Desktop that, in addition to a round of bug fixes, includes new options for installing and managing operating systems. In Parallels Desktop 7, the new Wizard interface for setting up virtual machines has a Convenience Store feature for purchasing copies of Windows, in addition to direct links for downloading and installing other popular operating systems such as Ubuntu, Chrome, and Fedora, and even installing OS X Lion using its Recovery HD partition. With the latest update, the Parallels Wizard now includes a quick way to access and install the latest Windows 8 developer preview in a virtual machine so you can test out Microsoft’s latest OS. In addition, the update also provides a way to install OS X Lion directly from the Lion installation application that you download from the Mac App Store. While you could previously install Lion from the Mac App Store download, you first needed to open the installer package and access the InstallESD image file directly. Now you just need to select the installer application to install Lion. While it may seem a bit odd to install Lion within Lion, in some instances it may be a useful thing to do, for example if you wish to test a software package before installing it in your main OS. Sequestering the software on a virtual machine will help you see how it installs and how it may run, and if a problem occurs you can easily remove the virtual machine and set it up again. The update to Parallels Desktop 7 is available through the Parallels Desktop updater (access this from the Parallels menu within the program), but also can be downloaded from the Parallels Desktop Web site. The next version of Hyper-V promises management and storage features that VMware can’t touch. VMware disagrees. After years of playing catch-up to VMware the upcoming version of Hyper-V is wowing the Microsoft faithful with unique new features — and gaining the attention of VMware users, too, one consultant says. Hyper-V will get an overhaul as part of the release of Microsoft’s Windows Server 8. Microsoft has not announced a ship date for Windows Server 8, although roadmap documents released some time ago pegged it for 2012 (earning it the nickname of Windows Server 2012). A developer’s preview of Windows Server 8, including Hyper-V, was made available during Microsoft’s BUILD conference in Anaheim, Calif., in September. The new Hyper-V is “at least on par and in some ways better than VMware,” says Aidan Finn, a Microsoft Most Valuable Professional working as an IT consultant in Dublin, Ireland. The MVP program honors individuals who share knowledge about Microsoft products but are independent of the company. Finn is the author of “Mastering Hyper-V Deployment” [Sybex, November 2010]. “Certainly, at the moment, Hyper-V is a better value for the money. When you start looking at some of the new features, it catches up with vSphere, and users are also getting some stuff that vSphere only does at top end,” Finn says. Finn says Hyper-V exceeds VMware in three areas: support for cheap server-attached storage and Just A Bunch Of Disks (JBOD) with features such as Share Nothing Live Migration; site-to-site failover for disaster recovery with a feature called Hyper-V Replica; and virtual networking with a feature called Hyper-V Extensible Switch. In addition, Hyper-V now scales to massive sizes, supporting more logical processors and allowing each virtual machine access to more virtual CPUs. Mike Schutz, Microsoft’s senior director of Windows Server and virtualization, contends that Hyper-V adds features that none of its competitors have. Most of Hyper-V’s gains over VMware start with storage, Finn believes. Hyper-V no longer requires a NAS, SAN or cluster. “VMware has had vMotion and high availability features, [but] they’ve been treated as the same thing in the Hyper-V world,” he says. Right now, “you have to store virtual machines on a SAN,” Finn says. Ergo, if you want to give Hyper-V a try, you have to have a SAN or be willing to buy one. That’s a very expensive thing to do, even on the low end. This changes in Windows 8. Hyper-V will be able to store virtual machines on a file server. Microsoft invested in remote direct memory access (RDMA) and built a new version of the Server Message Block file server protocol, dubbed SMB 2.2, which uses RDMA. This lets Hyper-V access files on another machine’s file server, and allows users to build an active/active cluster between server-attached storage devices. So if a file server fails, it automatically fails over to another one, Finn says. Live Migration will be supported between the server-attached storage devices, too, a feature Microsoft calls Share Nothing Live Migration. This is something “no one else in the market is really able to do today,” Schutz says. Share Nothing allows a virtual hard drive and a virtual machine to be transferred between server-attached disks over a network connection.